After the declaration of Rome as the Italian capital, the city underwent a feverish growth. The new status and the increase of the population called for to the construction of whole new quarters. By the beginning of the 20th century the entire area within the ancient wall had been built up, and the city began to expand outward. Besides a great work of modernization, along the river Tiber were built high embankments in order to prevent floods. The dictatorship of Mussolini (1922-1943) was marked by the destruction of old quarters and the realization of very pompous projects as via dell'Impero (now via dei Fori Imperiali), and Via del Teatro di Marcello, that were to celebrate the dictatorship self. Beyond the Tiber, the old medieval district of the Borgo was transformed by the building of Via della Conciliazione, which altered irrevocably the dramatic effect of Bernini's piazza in front of Saint Peter's. The district of EUR and the Foro Italico are typical of the grandiose conception of Fascist Rome. In 1940, Italy entered the Second World War on the German side. By the end of the war, the fascist regime was overthrown and Mussolini killed. The year 1944 is dramatically known for the happening at the fosse Ardeatine, where 335 civilians were shot by Nazi troops as a reprisal for the killing of 32 Germans soldiers in Rome. After the landings at Anzio and Netuno, the American army entered the capital in 1944. In 1946 Vittorio Emanuele abdicated, and less than a month later a referendum approved the establishment of a republic, with an elected president. In 1947 the constituent assembly passed the new republican constitution. After the World War II, been spared heavy bombing in consequence of its declaration as open city, Rome continued to expand at a rapid pace. The population grew from 1.6 million to 2.1 million inhabitants, and by 1981 was around 3 million. Its exponential postwar growth included the residential developments far out the Roman countryside. Its growth is bound also to its increasing prestige after the Second World War (1939-45). It is only since then that Rome, overtaking such major cities as Milan and Naples, returned to assume the old status of Italian leading city. 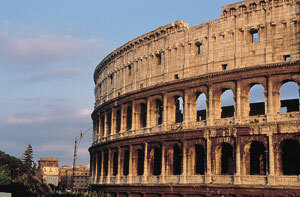 Rome's economy remains dominantly based on two activities, government operations and tourism. Most of the city's workers are employed in these fields, in wholesale and retail trade, and in other service industries. Besides, Rome is nowadays seat of the headquarters of many international corporations and agencies, such as the United Nations Food and Agriculture Organization (FAO), International Fund for agricultural Development (IFAD), and World Food Program. After the World War II, Rome also developed a wide base of industries. Together with traditional products such as textiles and tourist souvenirs, Roman industry produces also printed materials, high-fashion clothing, processed food, pharmaceuticals, machinery, and paper and metal products. Another important field of Roman economy is represented by the motion picture. Most of the Italian movies and programs are produced inside the world of cinecitta, considered by many the Italian Hollywood. But though the papacy has lost most of its power, Rome continues to be the central point of the Catholic world. Vatican City, most of which is located in an enclave within Rome, is the seat of the papacy of the roman Catholic church and has been recognized as an independent state by the Italian government since 1929. The majestic dome of Saint Peter's Basilica in Vatican City dominates the Roman skyline. 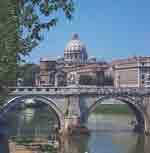 This religious importance, added to its historical interest, grant to Rome every year hundreds of thousands of tourists. Besides being a central point in Italy's railroad system, Rome is conected by highway with many parts of the country. That is why in Italy they say that all the roads lead to Rome. It is a result of the great work made century after century by Roman peoples. But Rome can also boast one of the busiest and most important Airport in Europe, caled Leonardo da Vinci, located near the seacoast. Besides, the city is served by a subway system. Rome is today easily divided into two regions: the inner city, within the Aurelian Wall, built in the late 3rd century AD after will of aurelian to enclose the area around the Seven Hills, and the sprawling outer city, with its suburbs. TheSeven Hills that sorrounded the old community are the Capitoline, the Quirinal, the Viminal, the Esquiline, the Caelian, the Aventine, and the Palatine. The Capitoline was long the seat of Rome's government, and the Palatine was the site of great structures such as the Palace of the Flavians, built by the emperor Domitian. Because of the large work of construction throught the centuries, most of the Seven Hills are now hardly distinguishable from the adjacent plain. The historical centre is a small area, mostly located on the eastern (left) bank of the Tiber, enclosing the traces of a neverending history that dates back to the oldest times and was steadily rennovated by great Roman characters, such as the emperors, nobles, wealthy families, and popes. Each of them left an indelible and lasting sign of its importance. That is why the monuments of Rome's past greatness are, for the most part, within the historical centre, in stark contrast to the modern districts. Having been for long the major city of Europe, Rome has become an unparalleled repository of monuments of all the periods, from the Etruscan to modern times. Unfortunately there are not many relics dating back to the earliest period of Roman history, that of the Seven Kings and of the Republic. Much greater is the artistical legacy of the following period, that of the Empire. Roman monuments range from the almost perfectly preserved Pantheon (founded in 27 BC and rebuilt in AD 118-128), considered one of the finest surviving temples of the past, to the still impressive-although partly destroyed- Colosseum (opened in AD 80), a huge amphitheatre for the gladiators combacts and other great spectacles. Besides the greatest monuments, oin Roma can be found ancient walls, triumphal arches, public meeting places, churches, and palaces of an extraordinary beauty. Among these monuments are to be admired the Roman Forum and the Imperial Forum, the old commercial and religious centres; the Baths of Caracalla, built in about AD 217 and now used as the setting for summer opera performances; the Catacombs, ancient tunnels beneath the city where early Christians practiced thei religious rituals, and the Castel Sant'Angelo, built as mausoleum for the emperor Adrian (AD 135-139) and converted into a fort during the Middle Age. Many of the great Roman basilicas date back to the 4th and 5th centuries but were partly or totally rebuilt after their decadence or destruction by fire. The Basilica of Saint John Lateran, the Cathedral of Rome, was erected during the 4th century and substancially rebuilt in the 17th and 18th centuries. The Basilica of Saint Paul Outside the Walls was also built in the 4th century and reconstructed after its destruction by a fire in 1823. The Basilica of Saint Peter in Chians, founded in the 5th century, was rebuilt during the 15th century and contains the Moses, a magnificent sculpture executed by Michelangelo during the Renaissance. Other popular points of historical interest inlude Piazza del Campidoglio, where it rises the statue of Marcus Aurelius completed during the 2nd century AD; Piazza Navona with its three monumental fountains; the Trevi Fountain, the famous baroque fountain where tourists use to toss coins, and Piazza di Spagna, where the famous Spanish Steps, built in the 18th century, ascend to the 15th-century church of Trinità dei Monti. From modern times one of the finest works are the structures built in occasion of the Olympic Games of 1960, and the first Islamic mosque of Rome, opened in 1995 after 20 years of construction. The architecture of the mosque rising across the Tiber River represents a blending of the Roman and the Islamic styles. Even the street pattern of the city bears the marks of its long and complex history. Via del Corso crosses most of the centre from Piazza Venezia, the geographic centre of Rome, to Piazza del Popolo, at the foot of Pincio Hill. During the Middle Age, this street was used for the horse-racing courses. Part of Piazza Venezia is dominated by the monument erected between 1895 and 1911 in honour of Victor Emmanuel II, the first king of united Italy. At the heart of the touristic area there is Via Vittorio Veneto, designed and built since the late 19th century and subsequently elected to commemorate Italian final victory in World War I (1914-18). On Pincio hill, north of the historic centre, lies one of the biggest public parks in Rome, the Pincio Gardens. Rome has been an urban centre for more than 2000 years. Most of the monuments of the city's history still stand, but they are more and more menaced by the destructive impact of pollution and by the vibrations provoked by the impressive and chaotic traffic. Rome's importance is not restricted to its historical sites and buildings, but extends to its cultural institutions. In Rome there are the biggest Italian institution of higher education, the University of Rome (1303), and the Independent International University of Social Studies. Its artistic wealth has fostered the foundation of many important specialized schools for creative artists, such as the Academy of Fine Arts, the National Academy of Dance, the National Academy of Dramatic Arts, the Santa Cecilia Conservatoty of Music, and the Central Institute for the Restoration of Works of Art. Rome is also seat of one of best Opera House of Ifaly. During the summer the performances are played on the extraordinary scenery of the Baths of Caracalla. The city boasts also more then 20 thetres and 6major concert halls. The museums of the city, among the best of the world, represent all the aspects of the art and sciences. The Capitoline Museum, founded in 1471, houses, among excellent antiquities, the oldest art collection in Rome. An outstanding collection of Etruscan and Roman art is exposed at the National Museum of Villa Giulia, the mid-16th-century country house of Pope Julius III. Another museum of sculptures and painting located inside an extraordinary palace is the Borghese Gallery, housed inside the early-17th century Villa Borghese. The National Roman Museum, designed by Michelangelo, exhibits some of the most beautiful sculptures of the Greek and Roman art, including the striking Ludovisi Collection. Other palaces of the city house important collection of art and decorative pieces. Among the others, the Farnese palace, erected between 1514 and 1589, the mid-15th-century Venetian Palace, with a celebre collection of small bronzes of the Renaissence period, and the Palazzo Barberini, a baroque palace of the 17th century that houses a remarkable picture gallery.